Gould Construction has taken a special interest in projects that present particularly difficult design and construction challenges or have unusually difficult schedules to meet. The excavating and grading requirements for the Aspen Highlands base area where such, that no other contractor submitted a proposal for the project. Gould Construction installed 25 dewatering wells for the site and moved 200,000 cubic yards of material offsite. 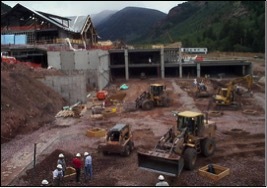 This project involved the complete development of the entire base area of the Aspen Highlands Ski Area. All of the existing base area buildings and infrastructure was removed and a complete new commercial core village and large parking structure constructed along with all associated infrastructure. Gould Construction is working as a subcontractor for all excavation, street construction and installation of utilities. The project also included installation of 25 dewatering wells, piling for excavation shoring and large concrete retaining walls throughout the project.